On January 8, 2008, Intuit will reveal Quicken Online, a new version of their financial management software specifically designed to work online. The service operates through a Web browser using Adobe Flash 9 technology and will cost $2.99 per month. 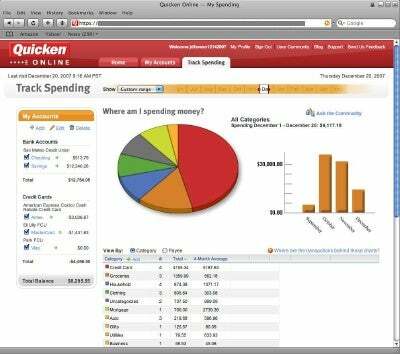 Quicken Online isn't designed as a replacement or even as a supplement to the popular desktop financial management software for Mac OS X and Windows, according to Jim Del Favero, Quicken product manager. Instead, it's designed to appeal to a separate kind of users all together. "We're expecting to appeal to people just out of college to their early 30s," Del Favero told Macworld. "People who have simpler financial needs, who are focused on knowing how much money they have and what bills need to be paid, and how to live within their means." To that end, Quicken Online enables you to download and reconcile information from financial institutions such as your bank and credit card companies. Once the initial data is gathered, Quicken Online will reconcile each account on a nightly basis to get information as up-to-date as possible. It will also automatically categorize transactions -- partly on the basis of who the payee is, and partly on how other Quicken Online users are categorizing their transactions. But it will always defer to how you've set it up, so if you want to specify individual names for payees or unique categories, you can do so, just as you can with the Quicken desktop application. 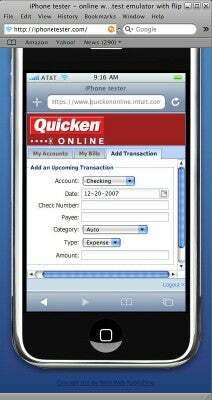 Quicken Online works on the iPhone, as well. Del Favero said that many Intuit engineers working on the Quicken Online product were early iPhone adopters and pushed to get the device supported. "Quicken Online works in Safari, and we're working closely with Apple to make sure it's Safari 3-compatible," said Del Favero. Del Favero wasn't ready to indicate final system requirements, but said that beside the iPhone, Quicken Online on the desktop will require Adobe Flash 9, Safari, Firefox or a Mozilla-based browser. It also works on Internet Explorer on the PC. Intuit utilizes a Multi-Factor Identification (MFI) system to make sure you're you when you log on, similar to what financial institutions require for you to log in to their online systems, though Del Favero indicates that Intuit's system is unique to them. The company is utilizing its own CustomerCentral system to manage data aggregation for Quicken Online. It's a system that consolidates data from thousands of financial institutions throughout the world, and Del Favero says that this system has a variety of checks, balances, locks and security protocols to prevent thieves from breaking in and stealing your identity. Quicken Online has to go through the same security audit process that banks do, he added. Quicken Online doesn't spell the end for Quicken desktop on the Mac, according to Intuit. Del Favero and another Intuit rep contacted by Macworld confirmed that Intuit is developing a new version of Quicken desktop software for Mac OS X that it plans to release in the fall of 2008.